An Artful Home Project - The Design Collective Group, Inc.
​We love clients who have a passion for art. And this client certainly has that passion. During our work together, we have seen them grow their own unique collection of glass, ceramics and wall art into an awesome assembly. And we have been blessed to have had the privilege to work with them on multiple homes to create the perfect venues for the display of their art pieces, taking the time to carefully consider the right location to place each piece. Imagine bringing together unique hand-blown glass and getting it displayed so carefully that both a combination of natural and artificial light highlight the brilliant colors. Consider the difficulty of placing a ten foot tall ceramic of a walking man inside a house. These design projects were not just challenging but increased our knowledge of artful display. The residence was designed to be a gallery for art but it needed to function as well. Creating niches for the smaller pieces was an important criteria while integrating larger pieces into the interior to make them feel a part of the space at the same time. The furnishings in neutral colored fabrics were selected to be stylish yet understated so as not to compete with any of the art. One of the challenges in the residence was in the dining room. Rather than a conventional light fixture over a table, a six foot by six foot spun glass sculpture was installed over the glass topped dining table giving the area a most imaginative focal point for the room. Bountiful storage (hidden behind the large Miro lithograph) provided much needed storage for dinnerware and serving pieces while keeping the space open, airy and placed for dimensional sculptures. Lighting was designed to be quiet yet strong enough to bring out the character of every object included in the spaces while emphasizing both texture and color. The great room of the residence is not just a place for the client's expanding collection of art but for imaginative, delightful conversations with those who have a similar passion for collecting art. One special piece added to their collection is "Walking Man," an assemblage of numerous glazed ceramic pieces assembled over a wire structure. 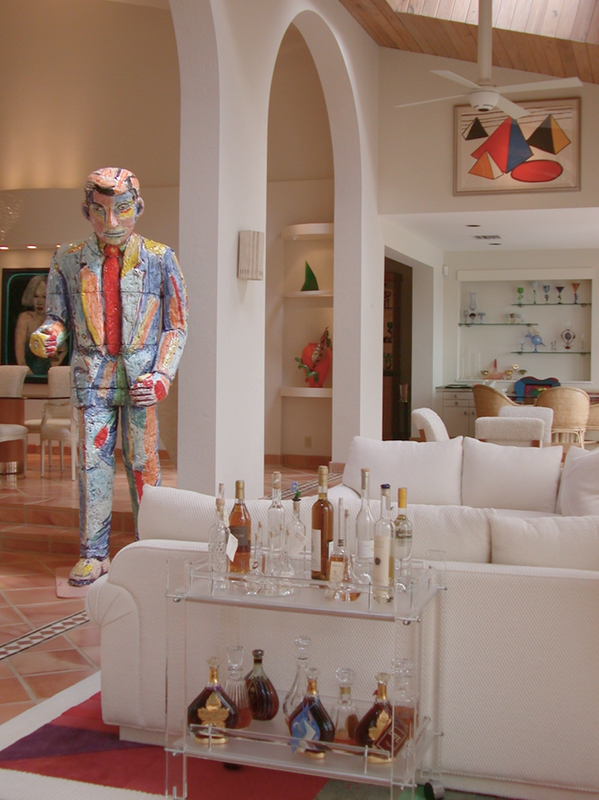 Nearly ten feet tall, he makes an entrance in a humorous fashion while feeling quite at home in the client's residence. The Master Bedroom is a quiet retreat for the clients yet not without its own art collection. Ceramics, metal work and glass surround the king size bed. And with cozy and comfortable seating, the space is a sophisticated environment to retire to.